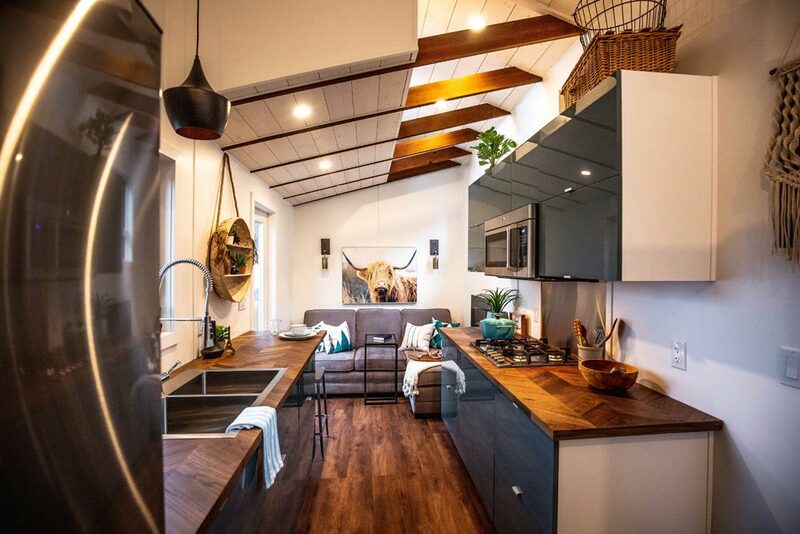 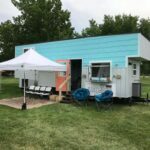 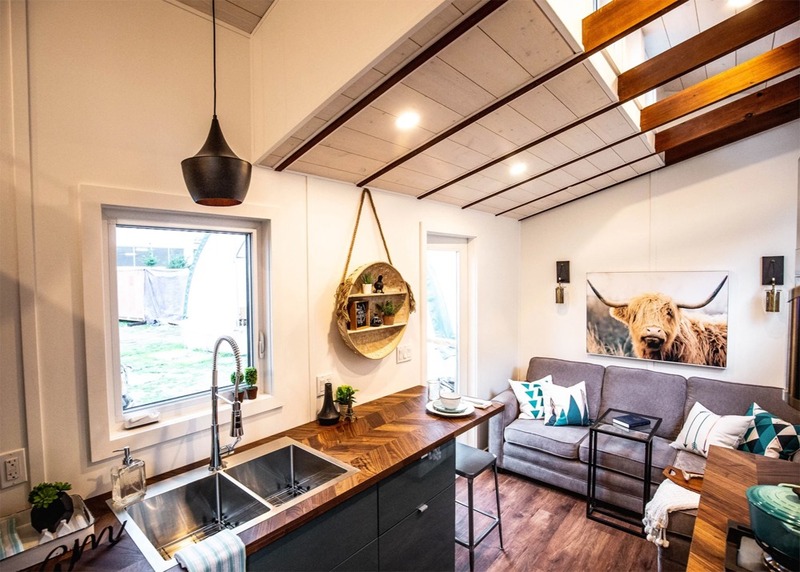 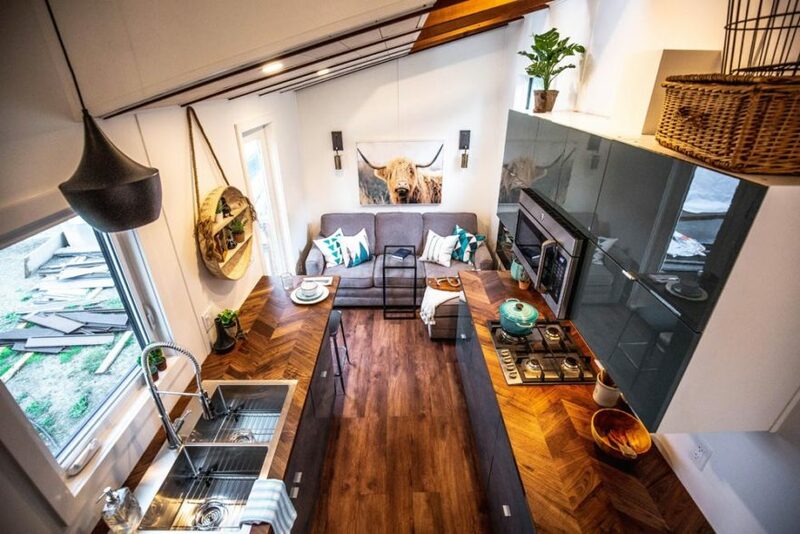 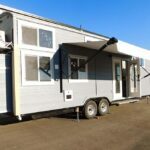 The Coastal Escape is the debut tiny home from Sunshine Tiny Homes, a family-operated business located along Canada’s Sunshine Coast. 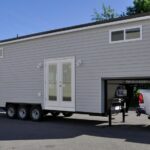 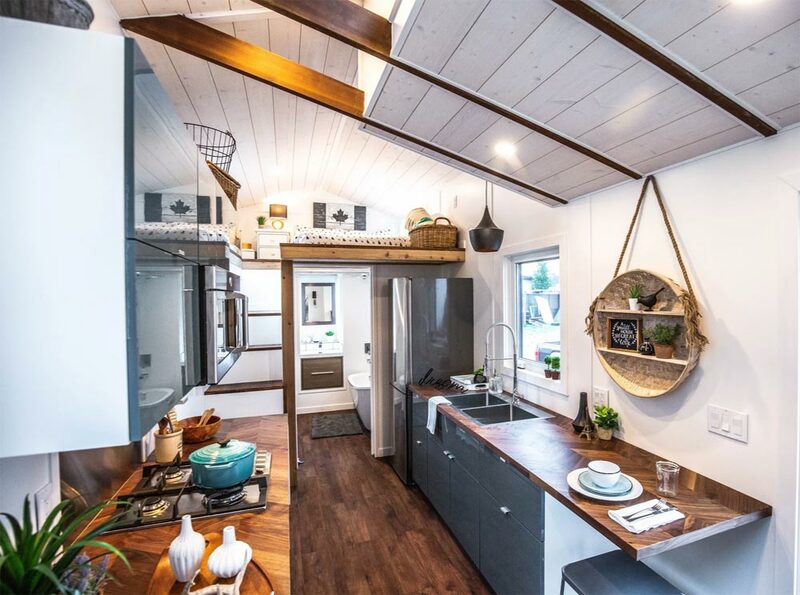 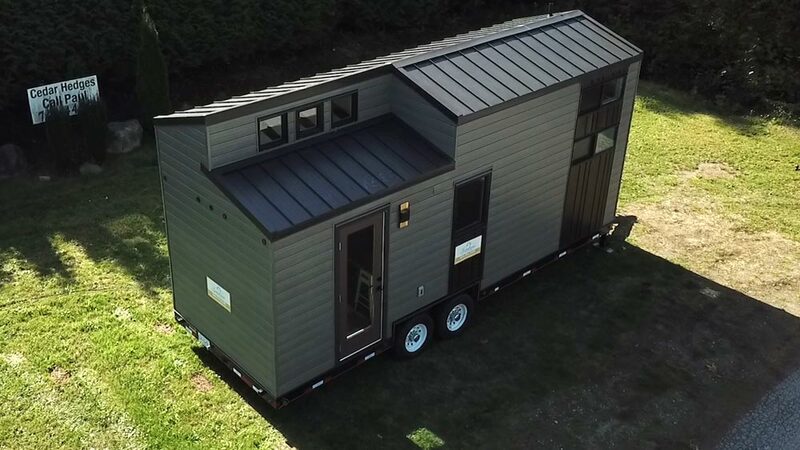 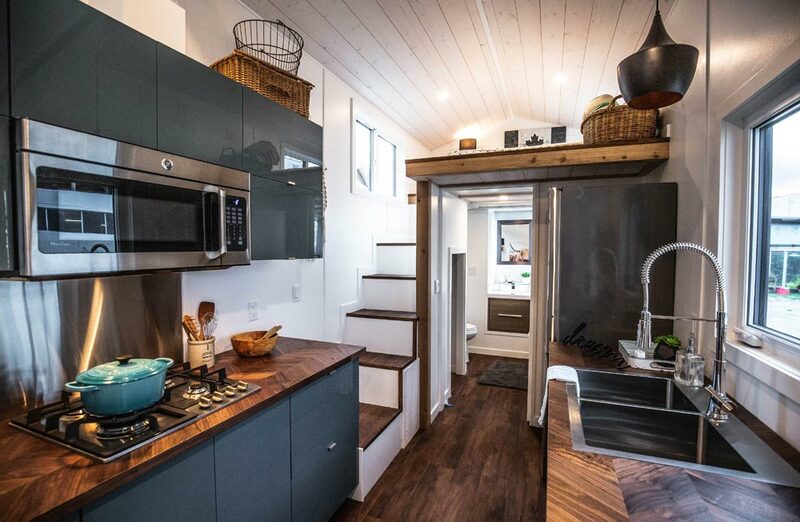 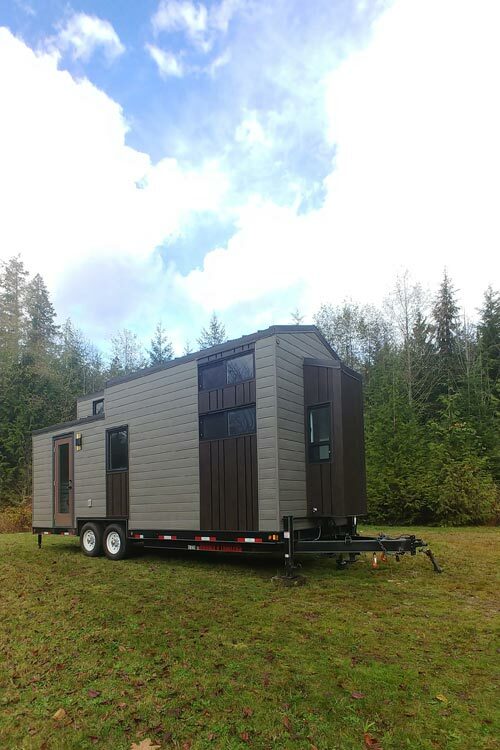 The tiny home sits on a 24-foot double axle trailer and measures just under 280-square-feet. 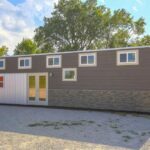 Gray Lux metal panels and a metal roof create a zero maintenance exterior. 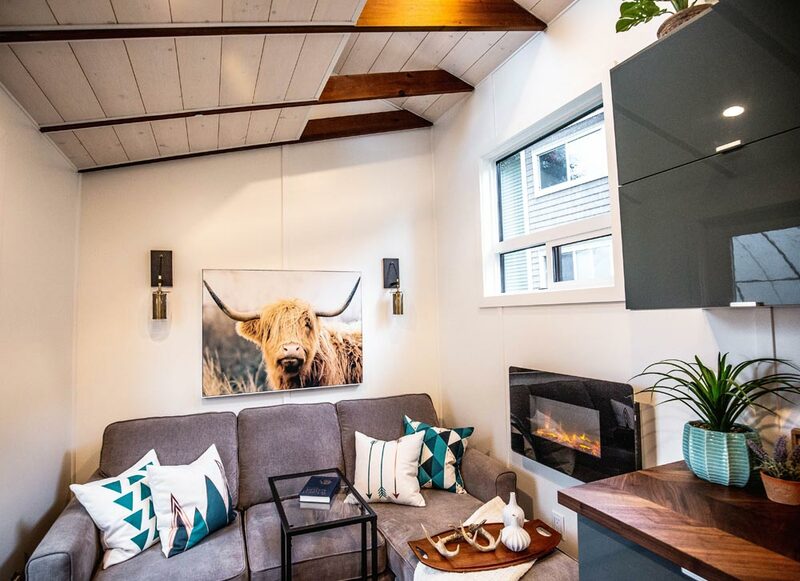 A full light entry door leads into the living room. 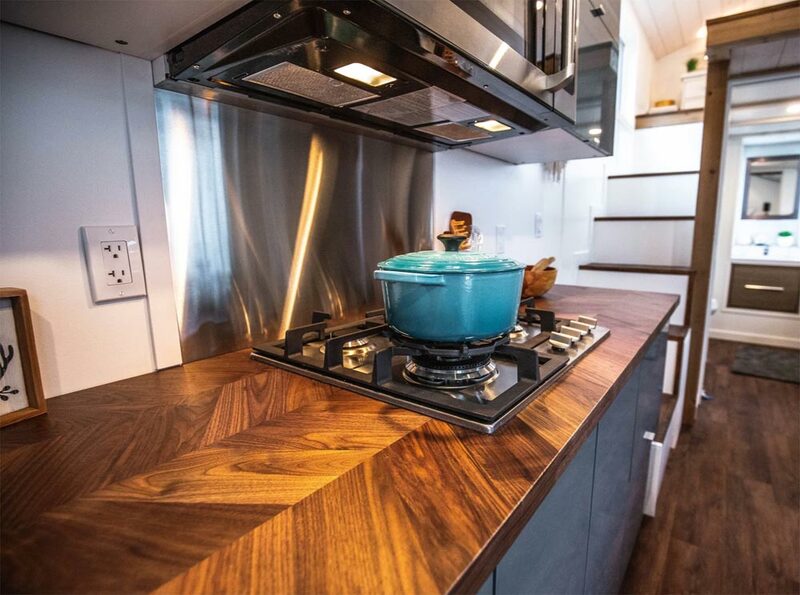 Inside the Coastal Escape is a stunning galley kitchen with wood counters in a chevron pattern. 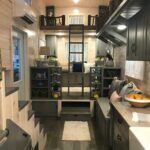 The kitchen also includes upper cabinets, a full size refrigerator, four burner gas cooktop, over-the-range microwave, and large sink with gooseneck faucet. 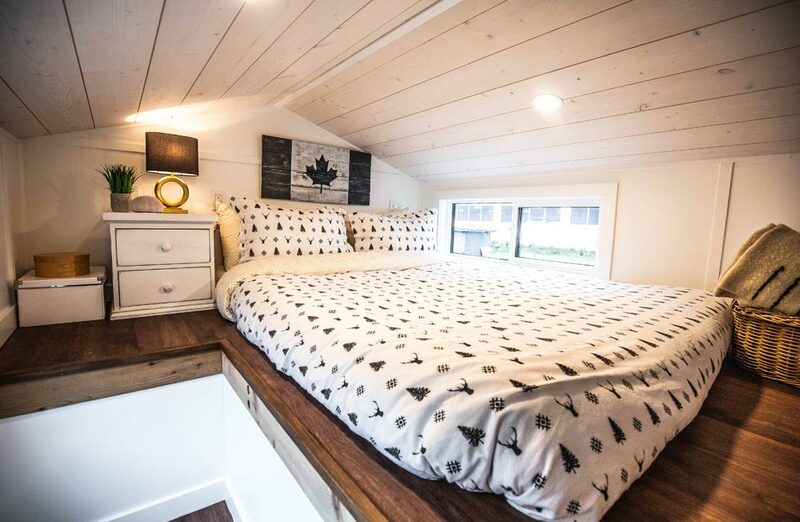 At the top of the loft stairs is a landing so it’s easier to get into bed. 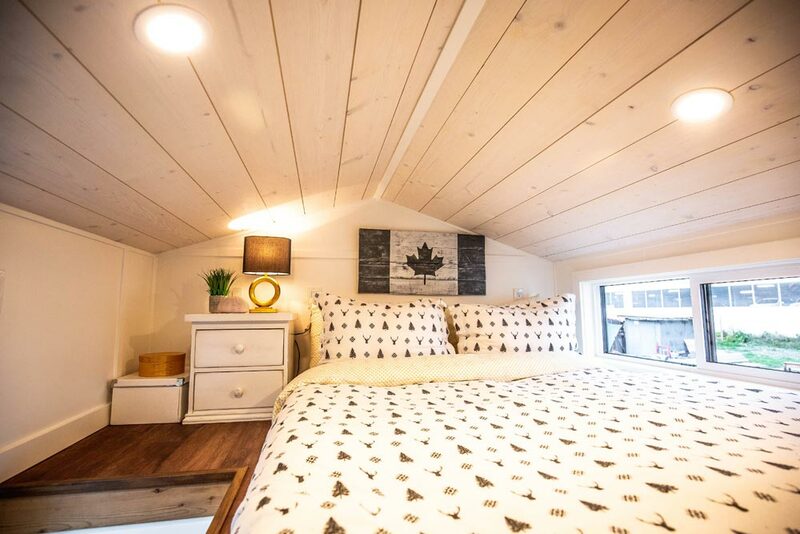 There is room next to the bed for a nightstand. 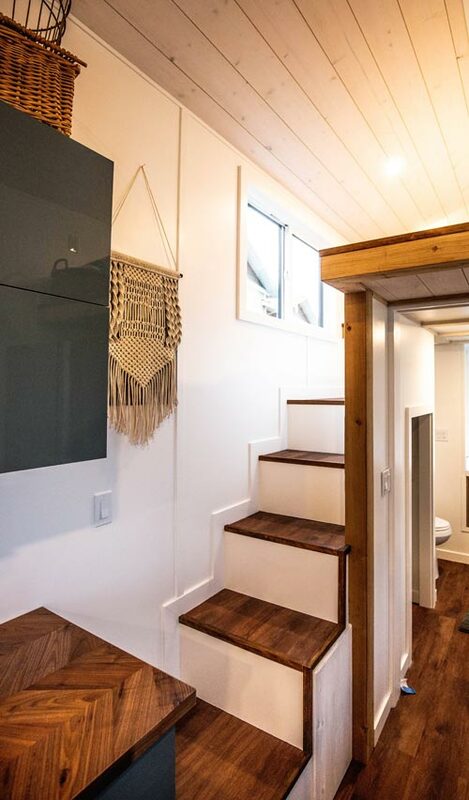 The bathroom is located below the bedroom loft. 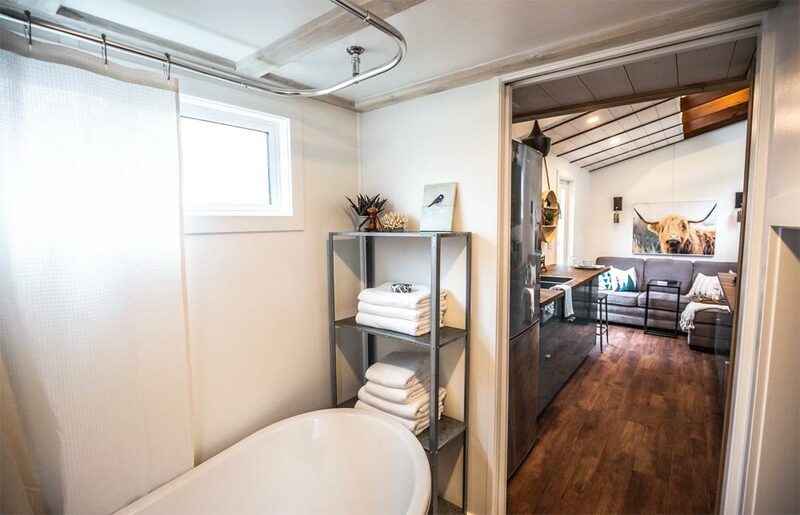 The bathroom includes a freestanding tub, sink, and toilet. 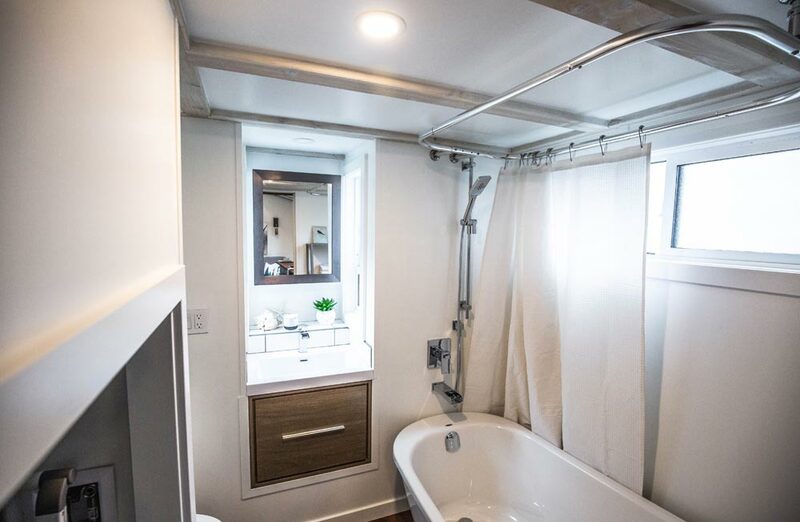 The sink is recessed into the pop-out over the trailer tongue, which opens floorspace in the bathroom and allows for a small window on each side of the sink. 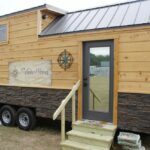 For more information about the Coastal Escape, please contact Sunshine Tiny Homes.